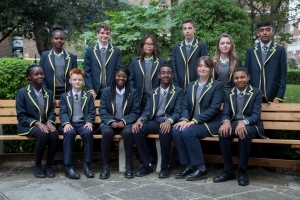 Introducing this academic year’s Head Teachers Ambassadors: This is the most senior student leadership responsibility at Key Stage 4. Every September, Year 11 students are selected by staff for this prestigious position. Ambassadors meet regularly with the headteacher and act as a conduit between senior staff and students. Ambassadors can be identified by their distinctive gold trim on their blazers.